Before you become overwhelmed, take a step back. Be an unbiased observer to your present. Gain perspective, not on how you THINK your reality is unfolding, but how it actually IS unfolding. Note what is truly important to you this holiday season. Is it staying late at work to make a few extra bucks, or is it going home early to see your loved ones? Is it bolting around town to every social engagement, or is it balancing your personal needs with the needs of those around you? There is no one "right" answer. Your truth is yours. When you feel the chaos of your surroundings, take a brief moment to come back this truth. Gain perspective. Make a commitment to count your blessings, say "thank you" and smile. It is CLINICALLY PROVEN to make you feel good. Show gratitude. Really. Close your eyes and take a deep breathe. Now, do it three more times. How do you feel? How-to: Come to stillness (sitting or standing). Begin by exhaling completely to create space for a full inhale. Now, take a breathe in and don't stop until your lungs are full. Slowly exhale on the count of 5. Repeat. On every inhale, notice your chest rising and lungs expanding. On the exhale, feel your sternum fall and imagine your burdens physically seeping out. Breathe. Last night, Ashely and I began crafting our latest and greatest passion project - Grip The Mat. With visions and ideas dancing in our heads and a limited amout of time to execute them, we came to realize that uncovering and specifying our intention for this project is of utmost importance to us and our audience. As we build our mission statement, it is critical that we to stay true to our personal goals. As always: be present, share positivity, think creatively, craft something awesome and amazing. 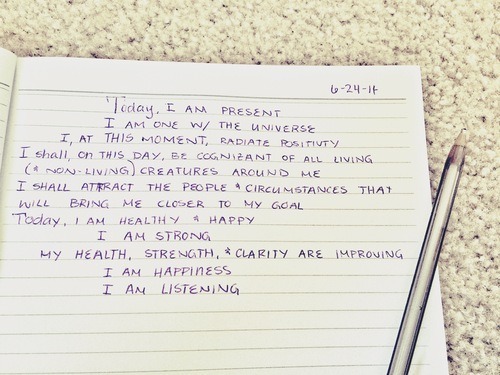 Daily intention setting has been a great help as we try to remain focused. Thoughts become words and words become actions. Constantly affirming your positive intention can create waves of change. Think it. Write it down. Do it.